I have seen factories switched over from bundle production system (assembly line) to one piece flow system. And now those factories further shifted their production system to an inline finishing with single piece production system. The success of this movement attracts many other garment manufacturers. What would be the reasons for shifting garment production layout from traditional assembly line to inline finishing system? If you are still working in assembly system, you should think of how you can get better output from the existing resources. In this post, I have listed top 7 reasons that may motivate one shifting their assembly line to the inline finishing production system. In the inline finishing production system, the finishing activities are on the sewing line, finishing workstations are added after stitching section. The finished quantity is considered as day's line production, instead of the end of sewing line output. The cutting section normally kept on the separate floor in case of shortage of floor space. Reduced chance of missing pieces in the production processes. A factory shows an example that when they used to send stitched garments for washing to outside facilities, it was difficult to track quantity. They lost some pieces in washing process or in transportation. In inline finishing, they have installed washing machines on the stitching floor and tracking garments from cutting to finishing become easier. Also, many garments can’t be shipped due to mismatched size ratio. With the new layout, you can quickly cut the required size and finish it for shipment. You can also prioritize the particular process in finishing processes and get the required order packed first. All processes are done on the same floor. Even individual washing machines, pressing workstation and finishing checking stations are set to each line. A factory can easily prioritize orders in all production processes - from cutting to washing to finishing meeting packing ratio. 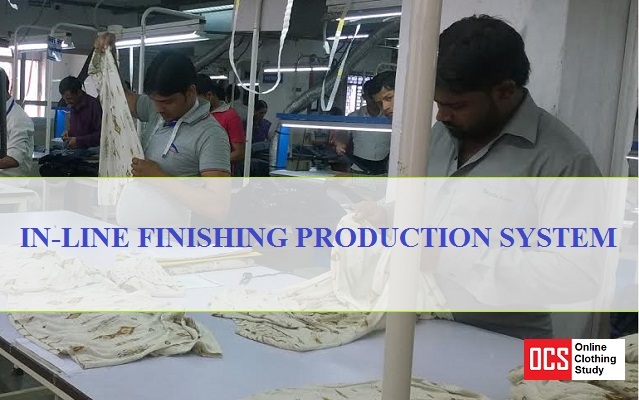 Factories have reduced total manpower in the finishing section, in checking and alteration tailors as defect generation reduced, need of rechecking and alteration work minimized. Total production lead time can be reduced by following inline finishing system. For an example, a garment unit has reduced the production throughput time from stitching to packing by 2 days. Productivity improvement is also seen in the new layout. As a result, you get an advantage in shipping your order in shorter lead time. Even the shipment lead time not reduced, factory gets additional time to complete the order without time pressure. As the total manufacturing throughput time is reduced and the finished garments are ready in less time, quality issues in the garment can be detected earlier. Quick detection of quality issues helps the factory to take action on the quality failure. The cost of quality can be reduced. The transparency in production qty and product quality improved in inline finishing system (with single-piece flow system). As a result, the process loss comes down, material utilization improved, and wastage generation reduced. In case, the order needs of the washing process, this benefit is applied. The washing machine capacity reduced drastically from 100 kg to 6-10 Kg in inline finishing layout. As a result, chemical requirement and wastage of chemicals are reduced in washing. Majors benefits of the inline finishing production system are explained in this article.